As a person ages, biochemical changes take place within the skin. In the deepest layer, the dermis, there are elastic fibers which allow the skin to stretch when the face is in action, then return to its original shape. These fibers are responsible for the skin’s ability to shrink after weight-loss. That’s why a young person’s skin will still look tight and youthful after considerable weight-loss, but a middle-aged person will begin to develop loose, saggy skin. Aging skin has less resilience due to the loss of elasticity of these fibers and connective tissues. The passage of time brings a weakening of supportive muscles in the neck resulting in additional stress to the skin. 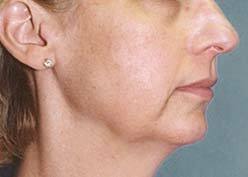 Fat depsosits develop in the jowls and the neck and cheeks become droopy under the jaw line causing loose, hanging skin around the neck. 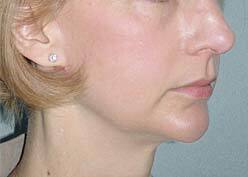 Women often develop two vertical bands beneath the chin as well. Everyone experiences this gradual deterioration of skin and muscle tone, but the degree varies considerably from individual to individual. Excessive and intensive exposure to sun, smoking, excessive use of alcohol, poor nutrition, lack of sleep and lack of exercise will hasten the aging process. There comes a time when no amount of exercise, face creams or diet will improve this natural aging process of the face. The looseness and droopiness can only be reversed by a minilift or a surgical facelift. These procedures are designed to tighten the skin and neck muscles beneath, and to reduce the fat deposits in the jowls and neck. The results vary according to inherent factors such as skin quality and texture, extent of damage, and bone structure. Results can be quite dramatic, with the patient looking younger, more rested and fresher. A minilift is a procedure performed in the doctor’s office that lifts the cheeks, lower eyelids and jowls and restores the natural curves and fullness in the cheeks and face. It’s much less invasive than a facelift and is suitable for patients with minimal looseness and sagging. The facelift region includes the entire cheeks down to the level of the jawbone including the neck. An incision is made from the top of the ear, around the front and barely inside the ear, under the earlobe, into the crease behind the ear and back into the hairline. The skin is loosened, the deeper muscle tissues and fatty tissues are tightened to form a firm foundation for the skin. The skin is then redraped and the excess skin is removed. The wound is then sutured. A small incision is made under the chin, and fatty deposits are suctioned from the area. If the vertical bands need correction, these are repaired at that time. 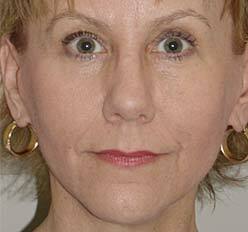 A brow lift corrects drooping brows, upper eyelids, and sagging skin on the forehead. It is designed to dramatically improve the horizontal lines and furrows in one’s forehead. It is performed by making an incision either at the hairline or within the hair (depending on the patient), and is carried from the top of the ear to the other, over the high point of the forehead. The skin and underlying tissues are loosened and pulled upward, and excess skin is removed, raising the eyebrows and smoothing out the forehead. Because the hairline is moved back, the forehead becomes slightly higher.